Happy Monday! It was a little gloomy in Chicago this weekend, but Mother’s Day made it way more fun! It was so nice to spend most of the day with my Mom – she was so happy to have 2 of her kids with her at church in the morning, and even happier to meet her other daughter and grandkids at lunch right after! As long as those boys are around, she is one happy Nana! 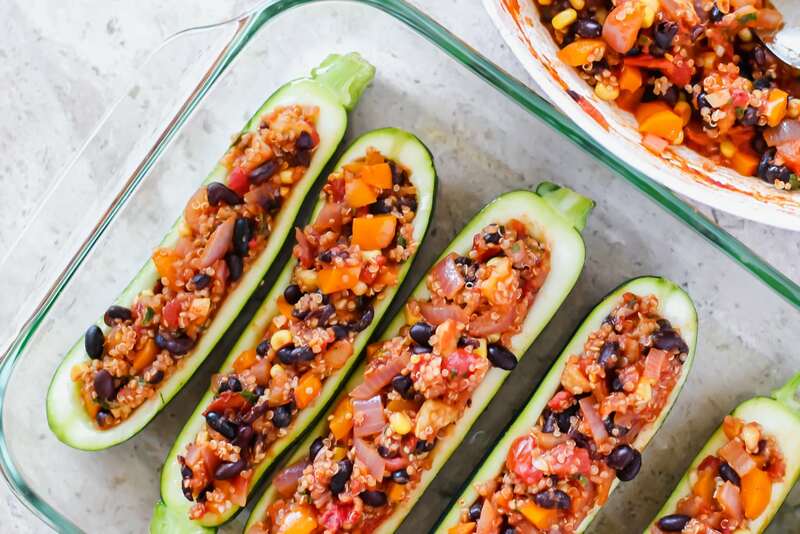 But now that we’re back into the reality of a work week, I thought I’d give you some Meatless Monday dinner inspo! 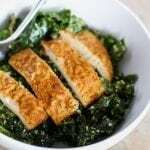 I’ve been trying to brainstorm a lot more recipe ideas for you guys recently, and easy and healthy are my top criteria! 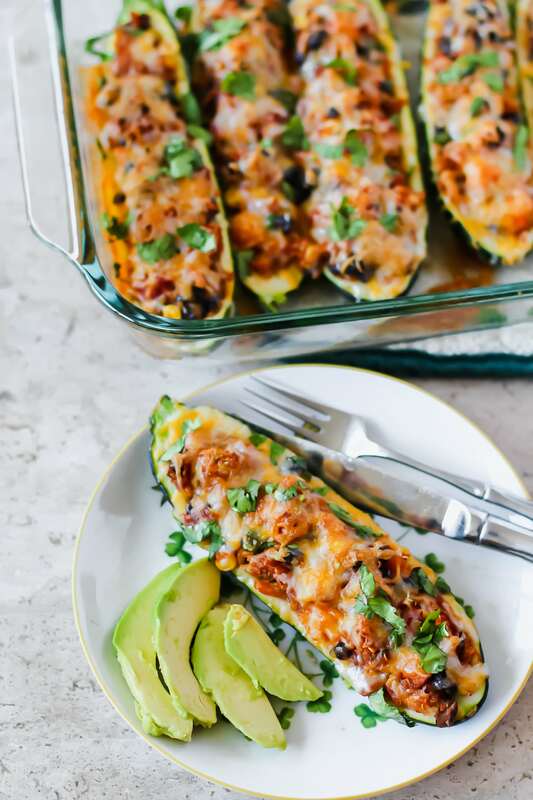 Since I’m a big fan of zucchini, I thought I’d finally venture into the world of zucchini boats, and guys… WHY DID IT TAKE ME SO LONG?! 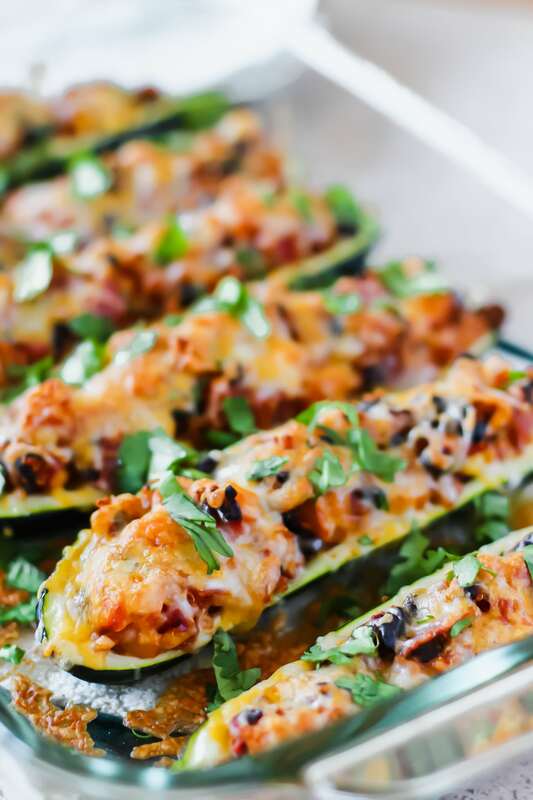 Zucchini boats are AWESOME. These little guys are SO easy to whip up and they look pretty cute, too! Plus you won’t miss the meat at all, thanks to the protein in black beans and quinoa. 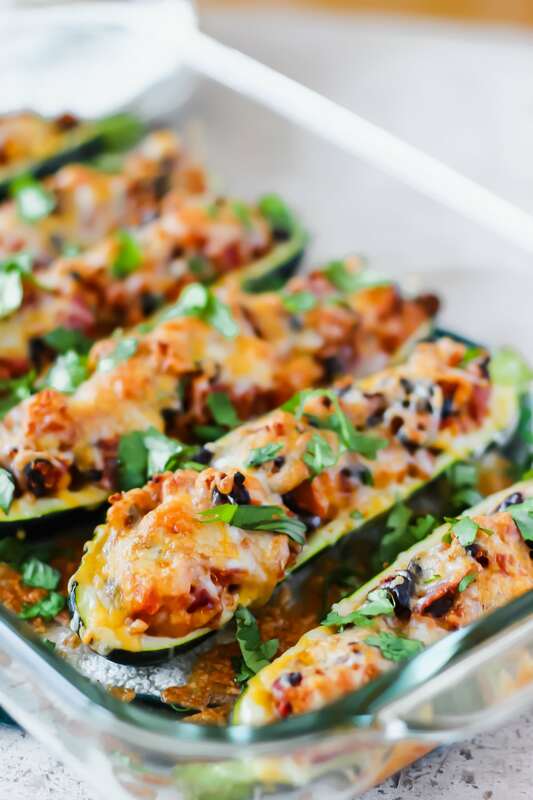 Also, now that I’ve mastered this recipe, I’m dying to try different kinds of zucchini boats. Maybe a chicken parm inspired version? 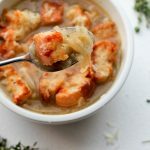 Throw some turkey meatballs in there? Or maybe use some thai or greek flavors?! I want to try them all! 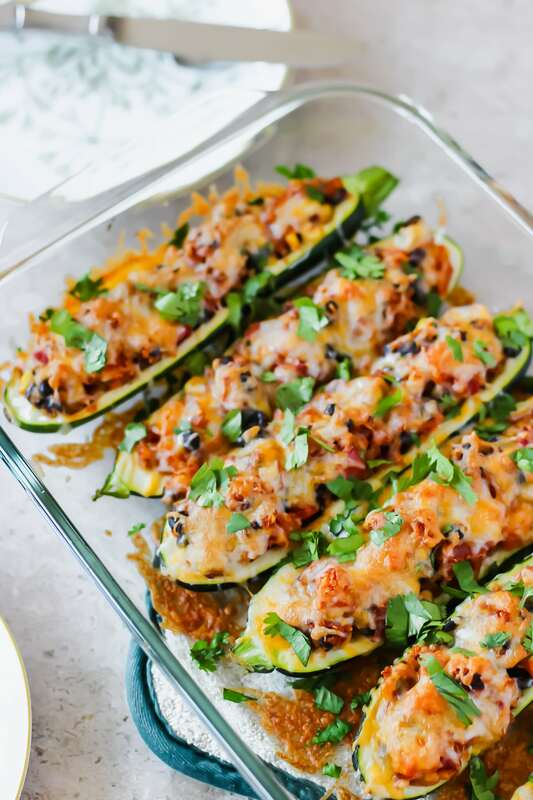 Do you ever make zucchini boats? Cook quinoa according to instructions on the package. Cut zucchini in half lengthwise, and then hollow out the insides. Place zucchini skin side down in a greased pyrex. Roughly chop the flesh of zucchini that you scooped out and set aside 1 cup of it. Chop pepper and onion into small pieces. Add to a pan with olive oil, salt, pepper, cayenne and cumin. Cook until the vegetables start to soften, about 8 minutes. 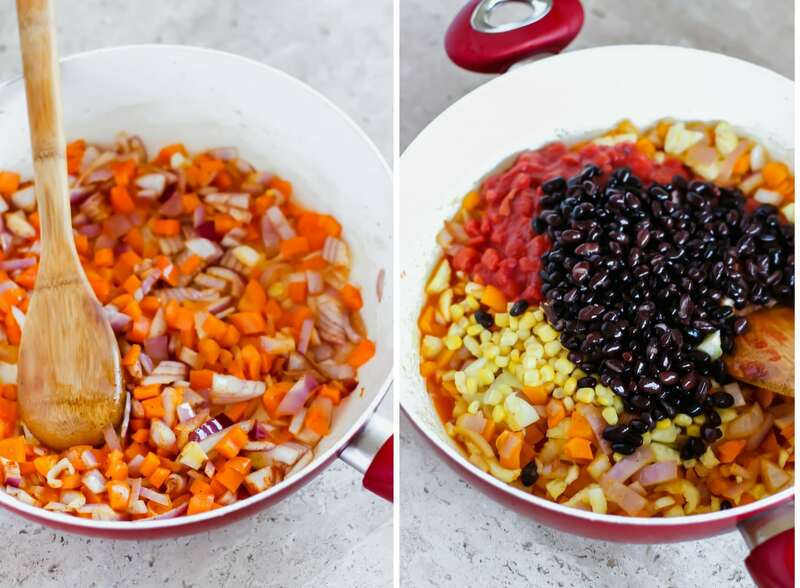 Add tomatoes, beans (drained), corn, chopped zucchini flesh, and garlic. Heat for a few minutes. Add chopped cilantro, quinoa, red pepper flakes and smoked paprika. Taste test and adjust seasoning to your liking. You could even add hot sauce to this mixture if you like it spicy! 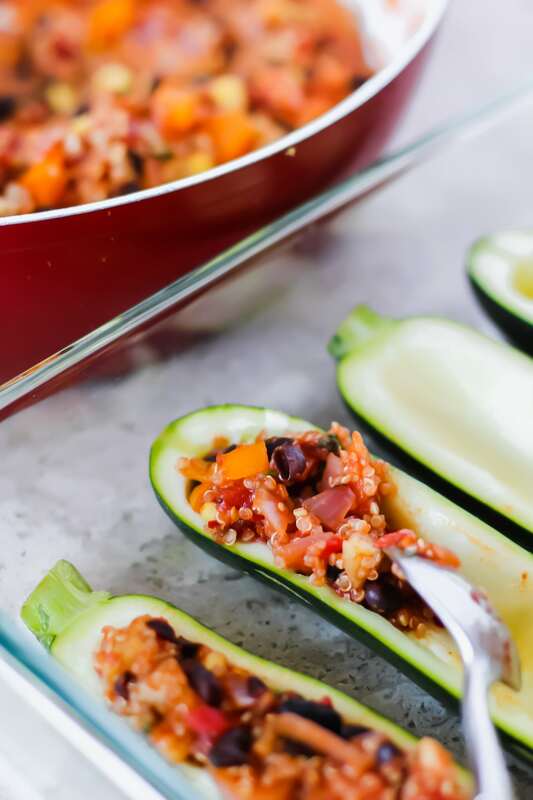 Spoon the vegetable/quinoa mixture into the hollowed out zucchinis. Remove from the oven, top with cheese and raise the heat to 425 degrees. 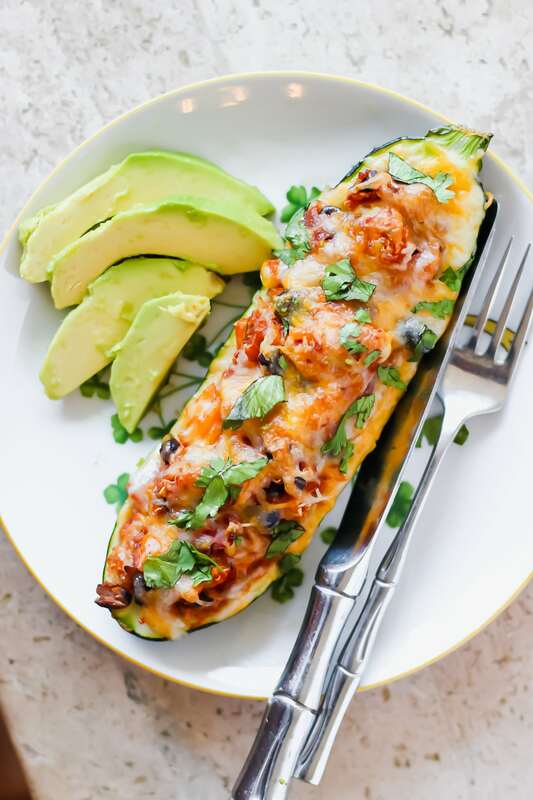 Cook for 5-8 more minutes, or until the cheese is melted and the zucchini is fork tender. 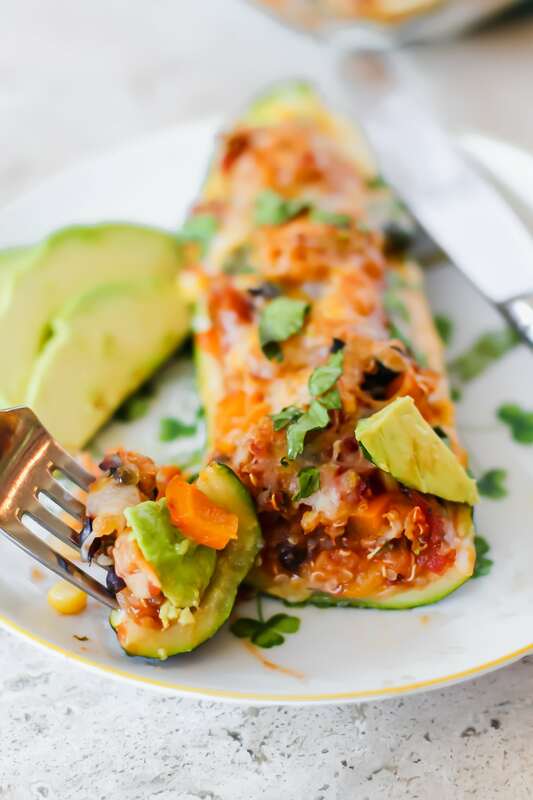 Top with more cilantro, avocado slices, and hot sauce or salsa! PS. 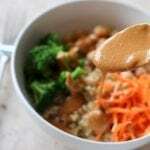 You might also like Crock Pot Zucchini Lasagna, Veggie Quinoa Bowl with Peanut Sauce, and Rustic Quinoa Tabouli.